The women who risk all to expose Chechnya's horrors: In the week that Natalya Estemirova was murdered in Chechnya, a dwindling but determined group of women vows to preserve her legacy, no matter the danger. Tatyana Lokshina has slowly watched her colleagues die. One by one, they have fallen to anonymous assassins, men of Russia's shadows protected by powerful forces whose appetite for murder seems to know few bounds. Last week, in a ritual that has become all too familiar, Mrs Lokshina donned a black head scarf to bid farewell to one of her closest friends. Accompanied by other mourners, most of them women, she walked in slow procession behind a open-backed lorry that rolled slowly down a rutted Chechen street. In the back lay the body of Natalya Estemirova, a fellow member of a dwindling group of female human rights campaigners dedicated to exposing the horrors they say the state has sanctioned in one of Russia's darkest corners. Like many of the mourners, Mrs Lokshina knows her life is a precarious one. Constantly in danger from those who seek to silence the voices raised in condemnation of the Chechen regime and its Kremlin backers, she has taken a conscious decision with her husband, a fellow human rights campaigner, not to have children. "I was kind of putting it off because of the work I do," Mrs Lokshina, who is 36, said. It is an understandable decision. Mrs Estemirova, who was bundled into a car on Wednesday and later shot at close range, left behind a 15-year-old daughter. The two women were close, bound together by the constant peril which they faced. Mrs Lokshina, an activist with Human Rights Watch, was in Grozny, the Chechen capital, with her friend before returning to Moscow the day before her murder. They had been working jointly to expose the ordeal of a Chechen man who was publicly executed earlier this month by forces loyal to Ramzan Kadyrov, the Kremlin-backed Chechen president who has been accused of presiding over a reign of terror in the republic. The man had been accused of providing rebels lurking in the southern mountains with a sheep, a crime considered sufficient to warrant an extra-judicial execution in Chechnya of late. The two colleagues were aware of their growing vulnerability. For critics of the Chechen regime, few places have seemed safe of late. In the past 10 months, eight opponents of Mr Kadyrov have been murdered in Dubai and Istanbul, Vienna and Moscow. Together the two women ventured into the dangerous Chechen countryside, questioning witnesses, accumulating evidence. In the evenings, they would sit in companionable silence drawing up their notes as Mrs Estemirova's daughter Lana brought them cups of coffee. Buried in their work, they tried to forget the danger, clinging to the belief that their prominence afforded them some protection against the gunmen. On occasion, especially after a mutual friend and campaigner was shot dead in Moscow in January, they would forget themselves and engage in morbid conversation: who would be next, they asked each other. Mrs Estemirova's murder was undoubtedly linked to her work. But according to fellow campaigners, its brazen nature was intended as an unmistakable message to the women who seek to complete her mission. "The manner of her death was symbolic," said Allison Gill, the head of Human Rights Watch in Russia. "She worked on hundreds of cases of people who were kidnapped, shot and killed, or disappeared. And here she is, suffering the same fate. They did it to say: 'You could be next'." Many inheriting Mrs Estemirova's mantle are women. The risks they face are self-evident and some organisations are considering the wisdom of exposing their staff to such danger. Yet the idea of surrender, for all the peril, seems out of the question. Even though many have families, and even though they have promised their relatives that they would stop putting themselves in the path of harm, few can stop. "To say that my mother doesn't like my job would be shamelessly euphemistic," said Mrs Lokshina, who started out as an academic researcher. The activists struggle to explain why they persist. Perhaps it is stubbornness, perhaps it is an awareness that no-one else would fill the void if they surrendered. Activists say they do not know for sure why there are so many women at the forefront of the Chechnya campaign, but suggest it could be because of a natural feminine empathy with human suffering that militates against the danger of seeking to alleviate it. When it comes to explaining what drove them to become involved in the first place, the women find it much easier to articulate their thoughts. 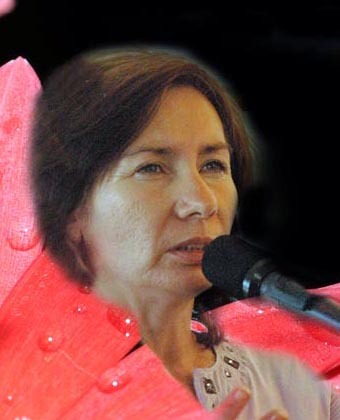 Mrs Estemirova was partly moved to become a campaigner after former pupils she taught at her school in Chechnya were either tortured or inflicted torture during the early years of Chechnya's rebellion against Moscow, which began in 1994. Mrs Lokshina, a chain smoker with a faint transatlantic drawl that belies a nervous energy, had little interest in Chechnya until she was sent there for a meeting by a US-funded rights organisation. "One has to see it with one's own eyes to understand the immensity of the tragedy, the immensity of the injustice," she said. "Once I saw it with my own eyes, I felt on a human level that the only way not to feel complicit, not to be complicit, was to do something to stop them directly." Like Mrs Estemirova, Tatyana Lokshina has been one of the principal characters who has woven the narrative of the Daily and Sunday Telegraph's coverage of Chechnya in recent years. Most of the others are dead. One such was the crusading journalist Anna Politkovskaya. who, though shunned by her countrymen, played a pivotal role for foreign correspondents seeking to understand Chechnya. In a cafe near her home, she would reveal in a low, urgent voice the latest atrocities she had uncovered on her many trips to the shattered republic. Often, just as she did in print, she would excoriate Vladimir Putin, the man she held responsible for the callous disregard for human life in Chechnya. One Saturday morning in October 2006, Mr Putin's 54th birthday, she was shot four times as she returned to her flat in Moscow from her local supermarket. Another was Stanislav Markelov, a lawyer, human rights defender and colleague of Mrs Politkovskaya, was felled by an assassin's bullet shortly after speaking at a press conference in January. Known for his sunny disposition and dirty jokes, Mr Markelov was another crucial figure in the Chechnya activist community. Shot with him was Anastasia Barburova, the fourth reporter at Mrs Politkovskaya's Novaya Gazeta newspaper to meet a violent end since Mr Putin came to power in 2000. Sulim Yamadayev was not like the others. A powerful warlord and Ramzan Kadyrov's chief political rival, Mr Yamadayev was rather one of those accused of torture and murder. He was also a valuable source, who boasted of his exploits over games of billiards Over interminable games of billiards before smuggling Telegraph reporters into the forbidden battlefields of the south. Fearing that Mr Kadyrov planned to murder him, he fled to Dubai where an assassin shot him dead in an underground car-park at the end of March. Then there was Mrs Estemirova herself. Working from a tiny office off Vladimir Putin Avenue in central Grozny, Natalya investigated and chronicled the parlous state of human rights in Chechnya. Along with a small but dedicated team, it was her work more than anyone's that held the Kremlin-backed regime to some account. Meticulous and level-headed, she was invaluable to any reporter heading to Grozny. "Hey Natasha," we would say, using her Russian diminutive. "We're coming down. Do you have a good story for us?" For Mrs Estemirova, the only prominent activist who lived in Grozny full-time, it was far more than just a story. To anyone who saw her in action, it was evident how passionately she cared about every victim whose cause she championed. "She completely gave her heart to every person she spoke to," said Mrs Lokshina. "I often saw Natasha crying when interviewing victims." Mrs Lokshina is aware that, in continuing her friend's crusade, the powers ranged against her and her colleagues is immense. None is more powerful than Mr Kadyrov. Mrs Estemirova's colleagues at Memorial, Russia's oldest human rights organisation, have accused the Chechen president of involvement in her murder. Mr Kadyrov called the accusations "insulting" and threatened to sue the organisation for impugning his human rights. An amateur boxer with a passion for racehorses, Mr Kadyrov plays the brash host at his Chechen residence, showing off his private zoo to fawning guests. In a bizarre demonstration of strength, he often joins his minions in striking his pet tiger, goading it first to anger then submission. On other occasions, he reaches through to fondle a leopard's neck before slamming the animal's head against the bars in a single, violent move. With humans, his accusers say, he is even more brutal. In a secret affidavit to the European Court of Human Rights, his former bodyguard painted a chilling picture of the Chechen leader. According to Umar Israilov, Mr Kadyrov would wander around a gym that doubled as a secret jail, administering electric shocks to prisoners bound to exercise machines while casually kept up a game of billiards with his friends. In January, as western reporters were preparing to publish his allegations, Mr Israilov was shot dead on a busy Vienna street as shoppers dived for cover. "I will be killing as long as I live," Mr Kadyrov once boasted to a reporter, although he consistently denied involvement in all the individual murders linked to his name. He is especially indignant about such allegations that he targets female activists. "I do not kill women," he has insisted. Yet women in Chechnya seem increasingly at threat. One of the cases Mrs Estemirova was struggling to expose when she died was the murder of eight women whose bodies were dumped in different parts of Chechnya one day last November. Terrified of the threat of collective punishment, relatives avoided speaking to her. That culture of fear, Mrs Lokshina said, is ever more widespread. "People share their story with you, whispering it into your ear and repeating time and time again: 'If you tell this to anyone, if you write about it, never mention my name and don't even mention the name of the village, because they are going to find me and my whole village will suffer.'" Mrs Estemirova's death will only increase the fear of ordinary people in Chechnya. Not a single murder of any significant opponent of Mr Kadyrov has ever been solved, a failure critics say suggests the acquiescence – perhaps even the complicity – of Mr Putin, Russia's most powerful man. The Kremlin has consistently denied such allegations, blaming the deaths on Russian exiles intent on besmirching Mr Putin's reputation. Since Mrs Estemirova's death, the responsibility for exposing the abuses she dedicated her life to revealing have largely fallen to women like Mrs Lokshina. But in the culture of impunity that reigns unfettered in Chechnya, it has become an almost impossible task.